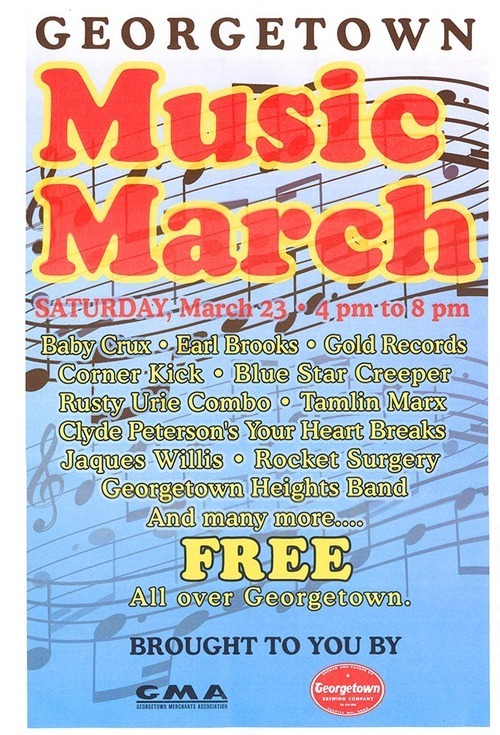 Georgetown Music March this Saturday! Just as the monthly Georgetown Art Attack draws attention to the visual artists working in Georgetown, the annual Georgetown Music March highlights the many musicians that live and work in the neighborhood. More than 15 eclectic musical acts will perform in cafes, clubs, and stores throughout the Georgetown business corridor on Saturday, March 23 from 4:00 to 8:00 PM. All performances are free and most venues are all ages. Maps and schedules will be available at participating venues the day of show. Georgetown once again celebrates our wacky and wonderful diversity with our monthly art walk! Music, art, and great food awaits you this month, both with Art Attack and with our annual Music March during the last weekend of March (info coming soon!). American Pie and Bakery hosts “Mechanical Birds, Masks and Marionettes”, watercolor paintings and illustrations by Braden Duncan. Calamity Jane’s hosts artist Javier S Ortega, featuring romantic dramatic stories a la pop surrealism brought to canvas. Syd Shera, clay art: raku tiles of Deep Space. Lotus Blossom mirrors. Raku pomegranates. Stacy Rosevear, oil painter, sculptor: Family portrait finished, it’s a deep look at family dynamics complete with abstracted masked faces in the form of a family portrait. M. Anne Sweet, graphic artist: Anne and her feminine/feminist themed art continue to inspire. Come enter her domain and see some serious feminist stuff with a twist. Sarah Woodson, potter: come see the newly famous to be Sarah of Downing Pottery. She’s showing her witty Seattle neighborhood oriented mugs at Nordy’s, she’s about to hit the big time folks! Melinda Hannigan, oil painter: Ahoy mateys, come see Melinda’s giant paintings. She’s stepping it up a notch, come see a painter take the next step. Tabasco the Blacksmith: Tabasco will show a variety of blacksmithed objet d’arte and a variety of functional things like tongs, fences and he has a large power hammer he might demo. It’ll be loud and fun. 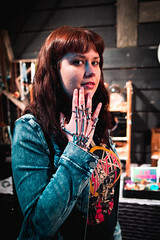 Lisa Geertsen, blacksmith: Lisa shows her annual Show of Hearts. Lisa has created a delightful variety of highly detailed anatomically correct hearts in various poses. Patrick Nelson and James Ryan, metal artists: will show steel sculpture. Pat may even be throwing on his pottery wheel, talented man that he is. Karl Seng, lampmaker extraordinaire: yow, come see Karls giant pink birthday candle, his lamp Le Guerre, and his gorgeous marble coffee table set in walnut. Fantagraphics Bookstore & Gallery presents book signing and art show “Susceptible” by Geneviève Castrée, with musical entertainment by Ashley Eriksson. Full Throttle Bottles has new stock of Sam Hamrick Cards, plus Beer Paper gift cards. The Georgetown Arts & Cultural Center hosts “Ascension/ Descension”, a solo show of never-seen oil paintings by Georgetown /Seattle resident Angielena Vitale Chamberlain. The Georgetown Liquor Company features Hallelujah Goat:a series of steampunk assemblages,old school tattoo flash paintings and drawings. 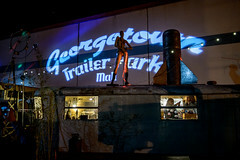 Georgetown Trailer Park Mall Wash Away Your Blues Party at the Georgetown Trailer Park Mall! Debuting new makers & curators of “Clocharde”. 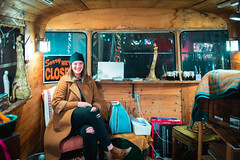 Peruse thoughtfully curated vintage & artisan collections of Modern Mystics, Frida Gallery, The Make Believe Shoppe, Beaver’s Den and witness the Trailer Park Cinema Melancholy Blues Spectacular! Krab Jab Studio presents “The Gathering” new works by pioneering Magic: the Gathering artists from an upcoming book of the same name, celebrating the 20th Anniversary of this iconic game. LxWxH Gallery presents “Catch and Release”, featuring work by Jana Brevick, Dorothy Cheng, Kimber Leblicq, and Tara Brannigan and focuses on sculpture and the body. Le’Objects for the Home features painter Amy Pleasant and part of her “Looking for the Coolidges” series. Machine House Brewery has a grand opening event from noon till late. Live music and djs, an art show with four local artists, games, brewery tours, and happy hour all day- including special new beers! A Masquerade Costume and Pinup Girl Lingerie presents “Kiss Army Attack!” a series of hand painted wall hangings of the album covers. Please join us as we Rock and Roll all night… well, at least till 9pm. The Roving Gallery presents work by fanciful resident painter Roxanne Fawcett. Sage Artistry Studios ignites the passion for glass. Stop by Bertoldi (Airport and Lucille) to see casted glass art from local talent. 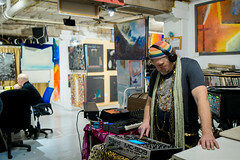 The Stables has live painting by Zach Bohnenkamp, John Osgood, CASH, Joey Brooks, Narboo, Starheadboy, 179, and friends. Free, beer!